Many businesses have employed call recording to help manage risk and comply with regulations. However, as the workplace is growing more mobile by the minute, you may be wondering how to extend this to your mobile devices. In this resource, uncover how mobile communications fit into your call recording strategy, and what it means for your enterprise. Uncover three mobile call recording options. 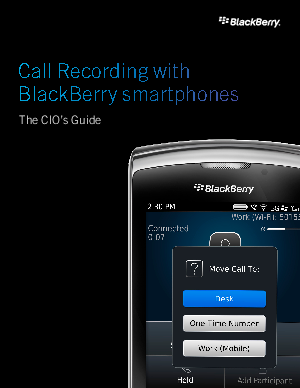 And then, learn the many benefits of BlackBerry MVS -- built to ensure secure, reliable call recording from just about anywhere you need it.